These little treats are something I have been creating for a little over a year now. Sara Douglas, CEO of Stampin' Up! shared this idea for Valentines Day a few Onstage Events back. I just love this idea! Quick and easy and makes people's day! 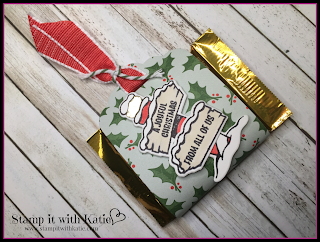 A Ghirardelli chocolate, wrapped in DSP. This DSP was punched using the scalloped tag topper punch. I added some ribbon to hold it together. All using the Santa's Workshop Suite.